Wildfires are tearing California apart. Maybe AI could help. Wildfires have torn through nearly hundreds of thousands of acres in California already this year, forcing evacuations and causing dozens of deaths. 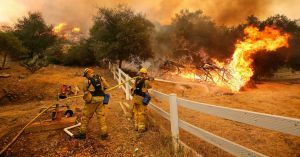 A new story by the Bay Area News Group looks at whether a combination of machine learning and new data gathering tools could warn firefighters about fires earlier, help responders evacuate areas more efficiently, and even save lives. The conclusion: Those technologies hold great promise, but none will be a cure-all in the face of worsening fires. Ultimately, experts and firefighters agreed that communication is key — the best fire detection systems prioritize sharing data between all the parties involved, be they humans, algorithms, government agencies, or other stakeholders. And sometimes, a breakthrough is simply a new item of consumer technology. Firefighter Jim Crawford told the news group that one of the state’s most valuable tools for fighting fires is the humble cell phone, which lets ordinary people call emergency services when they spot a fire.